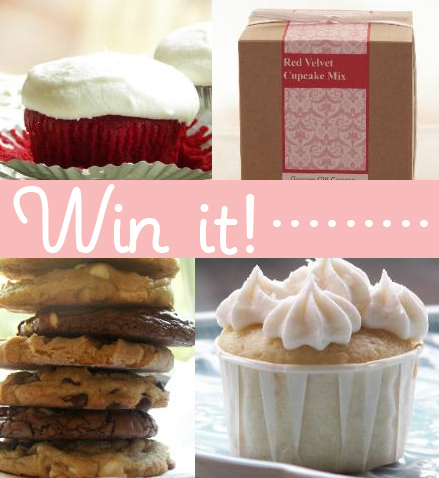 In The Mix: A Sweet Giveaway from Gourmet Gift Company! It's a funny thing, but somehow the shortest weeks always feel the longest. Perhaps it's the harsh reality of going back to real life after a sweet long weekend? It's official: you deserve a giveaway. Gourmet Gift Company has generously offered a $100 gift certificate to one lucky CakeSpy reader! Their website is chock full of sweet gourmet mixes for cakes (including flavors like chocolate, red velvet, vanilla and champagne), cookies, brownies and a variety of other treats. Just think how much sweetness $100 could get you on this site--you could pick up some sweet treats for yourself, and friends too! What a sweet gift-by-mail for a faraway friend or relative these mixes would be! Or, if you're planning a wedding or event, the gift certificate would get you quite a few of their unique customized favors. To put your name in the running, simply leave a comment on this post and tell which of Gourmet Gift Company's flavors you'd try first! Sorry, US entrants only this time; this giveaway will be closed on Saturday, May 30 at 12 p.m. PST, and the winner will be chosen at random and announced shortly thereafter.